Few months ago, my husband, Kiara and I went home to Bandung. We only passed six days there, but we managed to visit some interesting places. No, we did not travel around Bandung anymore. We went south, to Garut. 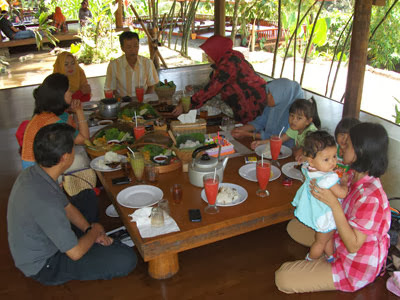 One of our agendas was attending a family gathering held in Nasi Liwet Asep Stroberi Restaurant. People simply called it Astro, the acronym of “Asep Stroberi”. It’s a combination of the owner’s name (Asep Haelusna) and its featured product (various strawberry menu). The restaurant area is very large and pretty hilly. Up and down, looking for the good cottage to book was exhausting enough for me. So, if you want to explore Astro, corner to corner, play the games there, not just eat and enjoy the view, I suggest you to workout a bit before, take some krill oil, vitamins, or whatever to improve your stamina. Because Astro is not just a restaurant. It is a little adventure to cheer up the family. For my husband and Kiara, it was first time they visit Astro. But for me, it was the third. First time was in 2007, two years after that nature theme restaurant had been built. I recall, besides enjoying the food, we also had fun picking the strawberry fruits from the garden. We arrived just in time, in strawberry season! It was very amusing. However, you must pay what you harvested in the garden. The staff will charge you per kilogram strawberry you take. Do you like strawberry, by the way? I am a fan of it. Although the taste of the fruit is sour. For ones who are not-so-strawberry-fans, don’t worry, there are still a lot of other deliciousness in Astro. The main dish here is nasi liwet (cooked rice with some seasoning such as union, garlic, salt, chili, coconut milk) served in a casserole with fried or roasted chicken or gurame, tempeh, tofu, salad, and sambal (sauce). You can also try another sundanese food like nasi tutug oncom (cooked rice with fermented tempeh). And there is sambal stroberi (strawberry sauce). Hot and sour. Yummy! Try also Astro’s fried rice, soup, tofu, otak-otak (steamed seafood). Of couse, there is always a strawberry juice. And due to chill temperature, Astro serves the hot beverages too, which are hot lemon tea, ginseng coffee, bandrek and bajigur, and so on. The second time I went to Astro, by the way, was in 2008. I tried a raw boat on the artificial river. Yes, another fun, another adventure. 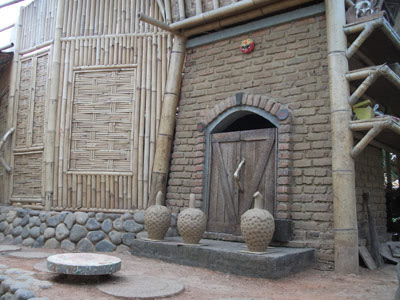 Astro also has flying fox, horse riding, and ceramics handicraft workshop (where you can be the pottery artist). I was glad. Because, he had teased me to play flying fox with him. Whereas, I do always fear of height. I looked to the flying fox tower and strings. It wasn’t so high, actually. The track wasn’t long either. I believe, the construction was built by a reliable stainless steel fabrication. No doubt about the strength and the safety. But, fear is fear, Buddy. I even fear riding the horse, remember? After all the games, we backed to the cottage. Enjoying the cool, natural air. Despite of its position that’s near a highway, inside the restaurant, we are like in the village where everything is fresh. No air pollution. It was relaxing to just sit or lie down on the gazebo’s floor. Chit-chatting, making some jokes, watching the golden fishes in the pool beneath our gazebo, listening the sound of clinking water from the waterwheel on the river, enjoying the view from green rice field and hills. Beautiful sights, indeed. Beautiful ambiance, as well. Where is Asep Stroberi, after all? If you want to go to Tasikmalaya from Bandung, West Java, you will meet a crossroad to Bandung, Garut and Tasikmalaya. Pick the road to Tasikmalaya and watch your left. See the strawberry statue or the mosque with strawberry dome? That’s Asep Stroberi a.k.a Astro in Limbangan. It opens from 7 a.m. to 9 p.m.
Another Astro is in Garut and Kadungora. I haven’t visited them all, but some people said that they serve differently. There are fishing pool and biking area. The views should be as lovely as in Astro Limbangan. wuih,dahsyatnya kelezatan stroberrynya,tiada lawan,hee heee..